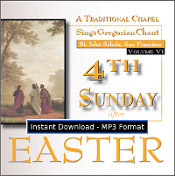 ChantCd.com | 4th Sunday after Easter Volume 6 MP3 DOWNLOAD EDITION | Get this 3 other CDs only $29.99! St.
Get this and 3 other CDs for only $29.99! 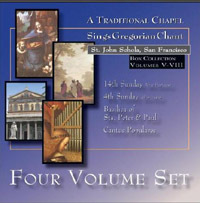 St. John Schola Vol. 5-8 Box Set. 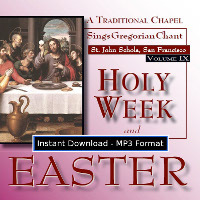 A small traditional Catholic schola sings the Hour of Terce and Holy Mass for the Fourth Sunday after Easter. The Hour of Terce of the Divine Office is the third Hour of the day, the one appointed to be chanted immediately before Holy Mass. The Ordinary chants here are taken entirely from Mass XI (Orbis Factor) of the Kyriale. 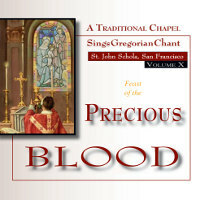 This CD also contains Credo 1, which has a beautiful melody. 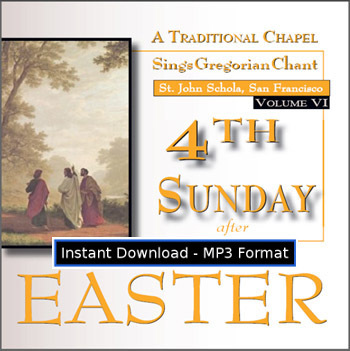 In Masses of Eastertide, such as this one, the Gradual is replaced by two joyous Alleluia verses. 61 minutes. Download a free PDF file containing most of the lyrics.